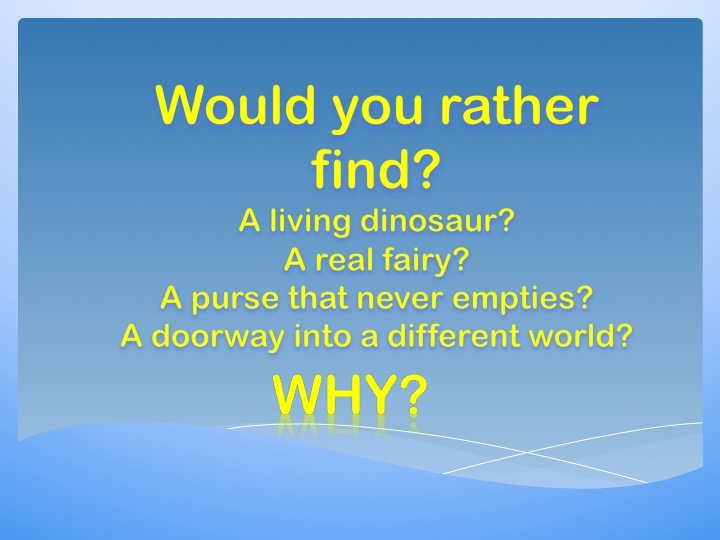 Thought for the week: What would you rather find? Next Post Happy Birthday Mr Reid! I would like to find a fairy, because they would make my birthday extra special and share their magic, like tinker bell . I want a fairy because i wished to see them flying around sharing their magic because I want to be a fairy to. I would rather find a real fairy,because if you became friends or best friends with that fairy, it could grant you any wish including a purse that never empties a real dinosaur an even a doorway to a different world. I would choose a fairy because it could grant me any wish anything I wanted but then again I could still choose a never ending purse. But Eden how do you know it will grant you wishes. I would chose a fairy because it would give me whatever I want. I chose a dorrway because I could so much candey. I would choose a purse because I could help people who are poor. Thank you for your thoughtful comment Joel. Lovely to hear from you. I hope you are recovering well. We look forward to having you back with us very soon. I know that it will grant me wishes, because we will be friends and friends do any thing for each other from sharing a sweet to getting them out of trouble!!!!!!!!!!!!!!!!!!!!!!!!! I would rather find a door in to another world because I can explore the other world. Nikita ,my sister, mentions that she would rather find a purse that never empties because if the fairy dies it can’t grant you any more wishes and because it is small it can be eaten by a dog. I disagree a dog does’nt eat fairy’s and even if the dog did eat fairy’s you can alway’s keep it safe. I would rather find a purse that never empties so I would have lots of money and I will be really rich and I could help the people by giving them some if they never had any money. I would rather find a doorway into a different world so i can see a new thing.